Whether you're just learning how to sew or are an expert seamstress, finding free sewing patterns has never been easier. Thanks to the Internet, you have a huge selection of free patterns for all skill levels right at your fingertips. You can find free designs for just about anything you might like to make, from decorations for your home to clothing and accessories for the whole family. If you're a true beginner, the place you will want to start is the free sewing book at Craft and Fabric Links. This great little ten-chapter book will show you all the basics of choosing a pattern, setting up your machine, sewing and more. Beginners can make a simple pillowcase out of any fun fabric. This is a fun way to get to know a sewing machine and create something cute at the same time. For experienced seamstresses, a puppy and cat baby quilt is a great option. This makes a wonderful handmade baby gift. For more advanced seamstresses, a cat beanbag can be a fun choice. Give this beanbag as a gift, or enjoy it yourself. If you're a beginner, download this .pdf pattern for a simple clutch purse. It's a great starter project and doesn't require much in the way of materials. If you're an intermediate-level seamstress, try this downloadable, free pattern for a summer outfit. It includes instructions for making a skirt, sundress, and beach bag. For a more advanced pattern, try making a blazer-style jacket you could wear to work. Amy Butler Designs offers a variety of free patterns from this noted fabric designer. You'll find beautiful home decor and quilting projects, cute accessories and clothing, and lots of ideas for embellishing your projects with appliques and fabric flowers. This is a great resource if you're looking for a hip, modern project. If you're new to sewing, try something simple like the downloadable Sweet Greetings Portfolios pattern. This design features a basic tie closure. If you have some sewing experience, the .pdf pattern for the Nigella Yoga Bag makes a great intermediate-level project. This practical design also makes a wonderful gift for a sporty friend. If you are an advanced seamstress, you'll love the free downloadable quilt patterns on this site. Try the bright and beautiful Charm Quilt. Sew Mama Sew is a fabric and notions store that also has a great blog. They often feature free patterns and tutorials, and you can browse through the archives to find the perfect pattern for you. Free Sewing Patterns is a blog that collects fun patterns from all over the Internet. You'll find designs for everything from home decor items to children's toys and clothing. BurdaStyle sells patterns for a few dollars, but they also offer free patterns interspersed with the paid options. Browse through the designs to find a great free download. AllCrafts collects free patterns from around the web and arranges them by topic. You can find patterns for toys, holiday projects, accessories, clothing, and more. FaveCrafts groups free patterns by skill level and offers free downloads of pattern eBooks. This is a great resource if you're having trouble finding the perfect project for your level of experience. With the incredible selection of free patterns on the Internet, the most challenging thing may be choosing the best designs for you. Pay attention to the number and complexity of the steps in a pattern. 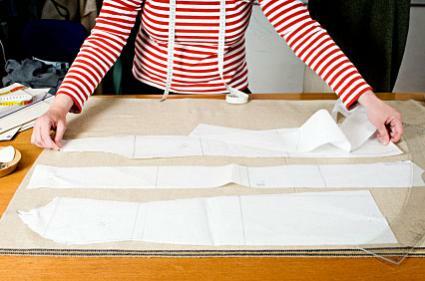 If it has more than ten steps, it's probably best suited to experienced or advanced seamstresses. Also take a look at the materials list to calculate the cost of making the project. Although the pattern itself is free of charge, you can still exceed your budget buying fabric and notions to complete it. As with all sewing endeavors, finding the right free pattern simply takes a bit of research and practice.